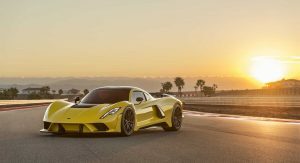 The Venom GT was one of the fastest cars ever made, but John Hennessey wants to go above and beyond with the Venom F5. To that end, his tuning company is going to make a bespoke V8 engine for the supercar. The Venom GT was powered by a 7.0-liter twin-turbo V8 that was good for 1,451hp. Instead of upgrading this engine and making it even more potent, Hennessey Performance is going with something new. 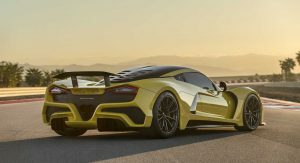 In an interview with TopGear.com, Hennessey stated that the Venom F5 will utilize a “completely bespoke, 8.0-liter twin-turbo V8” that cranks out 1,600hp. Hennessey added that the possibility of said V8 featuring a quad-turbo setup is pretty high. 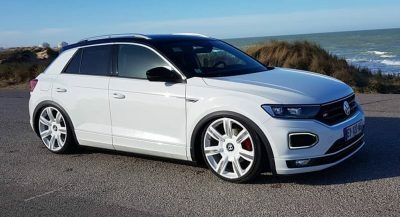 Apparently, the tuning company will make the decision to go with either two or four turbochargers before this year’s Pebble Beach Concours d’Elegance. With an 8.0-liter twin (or quad) turbocharged V8 engine that generates 1,600 hp, one would expect the F5 to turn out to be a land missile that’s only capable of traveling in a straight line. But Hennessey wants the car to be an all-rounder, which sounds like a difficult task. 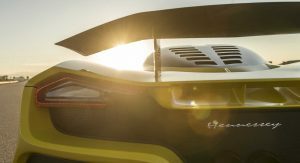 “We’re looking to build a car that is very comfortable on the road and delivers unbelievable straight-line performance,” said Hennessey. Even so, a high-downforce version with the massive splitter and massive wing could pop up at some point. 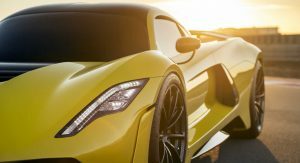 Only 24 units of the Venom F5 will be built and each one will go for $1.6 million. But with options, pricing for the supercar can easily eclipse the $2 million mark. Despite the price, 12 orders have already been placed, so there are still 12 left for sale. That front-end is so unresolved . It’s pitiful. I hope they change it for the final production version. Yeah, it’s not the prettiest front end but I have a feeling that computers are going to determine what it will look like with aerodynamics being as much of a challenge as it will be. I doubt they can make totally original engine, even Koenigsegg based their engine out of Ford block, I assumed they will used trusted LS block with custom heads and everything. Agreed. It is simply far too costly to develop and create an entirely original engine. 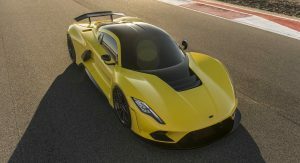 While cars like the Koenigsegg Regera, Rimac_C2, and theVenom F5 are obscenely expensive, I actually think it is impressive that they don’t cost significantly more. These automakers are tiny and they are developing completely bespoke hypercars at the pinnacle of what is currently possible. Unlike Bugatti/Porsche/Lamborghini, they can’t spread and share their development costs with other billion dollar corporate partners. They will never have the economies of scale that benefit others. Bugatti does not need to profit on their cars. Bugatti simply exists for VAG to showcase what they can do. 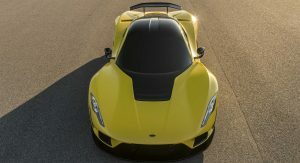 Koenigsegg, Rimac, and Hennessey are building bespoke hypercars at a level that rivals the largest automaker in the world with unlimited funds. It is crazy impressive and these men are automotive legends. Actually the problem with developing your own engine is not because it’s hard or cost a lot but more on how to homologate it for the road. Current legislation requires a lot of money to make an engine that pass emission and fuel consumption requirement. 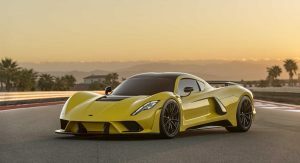 I still doubt is Hennessey is an automotive legends, I see it more like a Steve Saleen, he has skills to gather right people but he is not in the same league as Koenigsegg, Pagani or even Rimac. 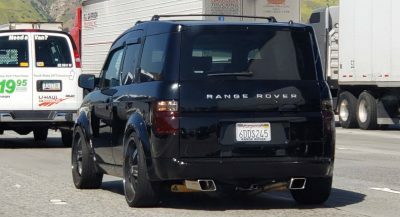 His company still has bad track record of undelivered vehicles and that like Saleen he takes credit more than he is to. Venom GT were designed in UK, with Hennessey in charge of the engine. The Chrysler ME Four-Twelve did that back in 2004. 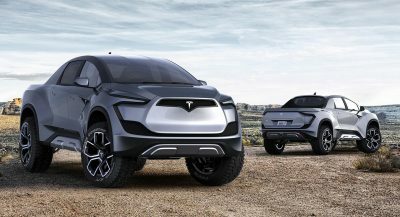 It’s a shame it never went into production. That was a beautiful car!! I meant to answer to the rendering to the future Mercedes SL. Somehow I hit this link. In regards to the Hennessey it’s nice. Have Quad Turbos? Yes it did. Should be more clear, especially the article headline is 300mph. EB110 has quad turbos… in the 90s.